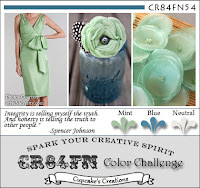 It's time for another wonderful color challenge at the CR84FN Blog! Thanks so much to those who played along with our last challenge! Our next Two Week Color Challenge is to use the colors Mint, Blue and a Neutral. I just love this sweet image from Cornish Heritage Farms, it reminds me of my boys when they were that age! The image is stamped in Black Archival on watercolor paper, then colored with STAEDTLER Karat Aquarell Watercolor Pencils, blending with Gamsol. The used the skin color STAEDTLER Marsgraphic Marker for the face, hands and feet. The edges were sponged with Ranger Antique Linen Distress Ink. Here's this weeks color inspiration, we'd love for you to play along with us at CR84FN, you can find all the details here on how to enter. If you upload to any online gallery please use keyword CR84FN54 so we can find your creations! Hug & Happy Mother's Day! Love the image and wonderfuL watercoloring! Happy Mother's Day! Love your cad and the image. That's a heart melter, all right. Love the image and how you've colored him. Love this sweet image and he looks perfect in the CR84FN colors! Sweet card! I adore this image and love this color combination. Beautiful card! Hope you had a wonderful Mother's Day! This is just adorable, a lovely vintage image of this little boy, and the colours are perfect for this image. I love this image - I seem to remember Ben hiding like this when he was little. Love the subtle colouring - just lovely! LOVE how you colored this DARLING image! (I have a boy)! LOVE the background paper, too! FAB card! I love your use of watercolors on this card and this is a super image. My oldest is a boy and it reminds me of him at that age. You did an outstanding job on this Lisa!